Droughts are natural disasters that grab us unawares. The main factors behind this include hotter weather, climate change, industrialisation and over-population. When there is no rain over one or several seasons and cattle, human beings and crops suffer a water shortage, the situation is called a drought. This happens frequently and on rather predictable lines. Drought occurs mainly due to failure of south-west monsoon (June–September). If rains give the slip one season, we have to stay parched till next season as almost 75% of India's annual rainfall is received during the monsoon. Monsoons are erratic in one out of four years. With wide variations in agro-climatic zones, drought is a calamity waiting to strike somewhere in the world and India almost every year. As in mid-90s, many African and Asian countries got affected severely from drought, 40-150 million population was devasted and production declined by more than 50%. In 1998, in Thailand, drought covered 95% of the provinces, affected crop area of 0.9 million ha, and loss estimated to be 2.4% of agricultural sector GDP. In the year 2004, 8 million people in 92% of the provinces affected crop area of over 2 million ha and production loss estimated to be 2.2% in agricultural sector GDP in the same area. In India the previous conditions in agricultural sector were not favourable, added to that severe droughts were enough to shake infrastructure of the Indian economy. India has already faced three droughts between 2000 and 2009. Given their frequency and predictability, logically, droughts should become easier to handle by now, but the improvements are not up to the mark. In 1957-58, the agricultural production loss due to drought was 50%. After that in 1987, drought affected 60% of the crop area and 285 million people and in 2002, 55% of the country’s area and 300 million people caught up by severe drought which resulted in decrease in food grain and rice production by 15% and 19% respectively. These are some highlighted impact of drought in the country besides many states continuously suffering due to drought conditions over the year. Parts of Rajasthan and Andhra's Anantapur and Chittoor districts see two droughts in five years; western UP and northern Gujarat face it once in three years. Maharashtra alone has about a quarter of India's drought-prone districts. About 50 million Indians are affected every year. In fact, climate change is accelerating drought attacks. There were six droughts between 1900 and 1950 and 12 in the following 50 years in different states of India and their effects were multidimensional. There is an official checklist of symptoms to diagnose one. The early warning signs include delay in onset of south-west monsoon, long 'break' within a monsoon, less rain in July resulting in rise in fodder prices, fall in water reservoir levels, dwindling water supply, and slower crop sowing. No one is expected to do much if rains swing -/+ 19% cumulatively of the normal for four weeks. Officials wake up when monsoons are forecast to be late and complaints of water crisis and heat wave become louder. More people start knocking on government doors for a job. Official limbs start to stir when monsoons are delayed, there is less rainfall for two weeks, and water crisis worsens. The situation is still only worrying. The favoured response in such areas is to cut a town's water supply by half, advice farmers to grow less water-guzzling crops, increase fodder supply, and keep the Centre's National Crisis Management Committee (NCMC) informed. 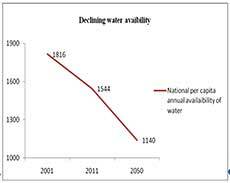 The graph shows declining per capita water availability from 3,816 cubic m to 1,140 cubic m over the past 50 years, while the global average hovers at around 6,000 cubic m.
India is facing dire need for greater and more efficient water storage, without which the country’s grossly insufficient storage capacity amplifies the effect of rainfall deficits, and control drought conditions. While per capita availability of fresh water has declined sharply from 3,000 cubic m to 1,123 cubic m over the past 50 years, simultaneously, each year India is estimated to lose the approximately two-third of the new water storage capacity to excessive siltation and improperly managed run-off. It becomes an emergency when there is virtually no rain during the sowing period; monsoon withdraws mid-season; and a dry spell for more than a month. The deficit in rainfall by now could be as much as 40% and crops start to wilt with no water and excessive heat. The problem becomes acute and gets classified as a potential disaster when there is no rain for more than six weeks in a crop area, and the monsoon withdraws early, leaving behind parched land and people. If 20-40% of India's area is hit, it is called a drought year. If more than 40% of the country is reeling from rainfall shortage, the met department calls it an All India Severe Drought Year. The primary responsibility of catching the early signs, offering relief and managing droughts lies with states. This is why they are usually in a dilemma over whether or not to declare a drought. There are various ways in which a drought can be defined. A meteorological drought is when there is a shortfall of rains. A hydrological drought occurs when deficient rainfall leads to plummeting water reserves. And agricultural drought is declared when the lack of water affects crops and harvests. Poor rainfall and drought conditions also have an adverse economic and social impact, particularly on India's rural communities, which account for around 60% of the nation's population. The impact of drought is felt directly by farmers, due to poor crop yields or crop failures, which results in reduced farm incomes, and this has wider transmission effects throughout rural communities due to lower consumer spending by agricultural households. Since a large share of Indian rural households is still living in poverty, they are extremely vulnerable to loss of income as they have limited savings to draw upon. Many farmers in India are also deeply indebted and need good harvests to allow them to recoup financial losses and repay loans. And as drought ruins their harvests, many desperate farmers kill themselves. Drought is a major factor in the thousands of farmer suicides afflicting India over the last few decades. Furthermore, the problems have accelerated migration of rural communities to urban centres, putting more pressure on cities already stretched in terms of resources. The main wastage of water from cycle is done as runoff of water that is improperly channeled and fails to efficiently recharge ground water levels. The failure to upgrade water storage capacity can be traced back to inadequate policy attention towards de-silting dams, tanks and canals and also on repair and maintenance to plug leaks along the way. We can easily learn from our ancestors the ancient and meticulous techniques of water harvesting by initiating Bawari system or stepwells of Rajasthan and other states of the country should be promoted a sustainable community - focussed approach towards water conservation. Some more mitigation strategies can also be followed to restore available water as public information and education campaigns, emergency conservation programmes, water service restrictions, restrictions on non-essential uses of water, prohibition of selected commercial uses, drought emergency pricing, water rationing programmes, improvements in water systems, emergency sources of supply, management of available water resources and establishing harmony between extraction and restoration could help us to avoid a bleak future ravaged by endless cycle of floods and droughts. Droughts endanger lives and livelihoods through thirst, hunger (due to crops dying from lack of water) and the spread of disease. Millions of people died in the 20th Century due to severe drought and famines in Africa. One of the worst hit areas was the Sahel region of Africa, which covers parts of Eritrea, Ethiopia and the Sudan. Droughts and famines can have other geographical impacts. If drought forces people to migrate to a new home it could put pressure on resources in neighbouring countries. The Sahel region of Africa has been suffering from drought on a regular basis since the early 1980s. Agricultural production plays a key role in Sahel’s economy. It is a critical mainstay livelihood at the individual scale and at the national level as well. The agricultural sector employs around 58% of the labour force in Sub-Saharan Africa. In contrast, Sahelian countries present a much larger figure. Indeed, about 80% of the population in Sahel depends on agriculture as their main source of employment. For the region as a whole, the agricultural sector is considered to be dualistic with millet, maize and sorghum destined for subsistence and cotton and groundnuts being the cash crops. The share of the agricultural sector in the national gross domestic product (GDP) varies across countries. It ranges from 17.2% in Senegal to 62% in Guinea Bissau. While Sahel’s dependence on agriculture has been growing over time, evidence suggests that the productivity of the sector has declined. Moreover, despite its large share of agricultural population, Sahel relies heavily on imports of foodstuffs, an ironic situation when compared to the United States where only 3% of the population comprises farmers, but they provide up to 17.14% of the world production of cereals. Sahelian countries are in general agrarian economies; therefore, the study of the economic impacts of climate variability can be done from the perspectives of the agricultural sector without loss of generality. The area naturally experiences alternating wet and dry seasons. If the rains fail it can cause drought. In addition to natural factors, the land is marginal and less fertile. Human activities such as overgrazing, over cultivation and the collection of firewood can lead to desertification, particularly when combined with drought conditions. The result is crop failure, soil erosion, famine and hunger: people are then less able to work when their need is greatest. It becomes a vicious circle and can result in many deaths, especially among infants and the elderly. In Niger in 2004, the situation was made worse when a plague of locusts consumed any remaining crops. In these cases, people rely on food aid from the international community. On its own, food aid is unsustainable in the long term. The first to be toppled were farmers, both subsistence and commercial, who experienced massive crop failures in the last two harvests. In South Africa, the continent’s breadbasket, agronomists estimate that 30 to 40% of all corn crops will fail this year, and food prices have spiked for consumers across the region. As many as 36 million people in Southern and Eastern Africa now face hunger, according to the United Nations. But the drought has also reshaped lives in less obvious ways, says Victor Chinyama, chief of communication at UNICEF Zimbabwe. School enrollments are down, for instance, as families are forced to put their children into the workplace to make ends meet. Girls are particularly at risk, he says, as families are forced to contemplate early marriage to reduce their financial burden. “Of course there are immediate matters of survival,” he says, “but it’s also important that we don’t lose track of the long-term impact this drought could have on a generation’s development.” We can say that drought is affecting these countries as a whole on household and social level.